Laboratory Glassware,Laboratory Glasswares,China Laboratory Glassware,Laboratory Glassware Manufacturer,Laboratory Glasswares Exporter - YANCHENG CORDIAL MEDLAB CO.,LTD. For more information, please enquire us by email. The chemical resistance of CORDIAL® exceeds that of most metals and other materials even where long exposure times and temperatures in excess of 100°C are involved. Exposure to water and acids only results in the leaching out of very small amounts of mainly univalent ions from the glass. The resultant very thin layer of silica with few pores in it that is formed on the surface inhibits further attack. CORDIAL ® has very high resistance to attack by water, neutral and acid salt solutions, strong acids and mixtures thereof, and also chlorine, bromine, iodine and organic substances. Only hydrofluoric acid, solutions containing fluorides such as ammonium fluoride, very hot phosphoric acid and strongly alkaline solutions attack the surface of the glass to an increasing extent at higher concentrations and temperatures. A feature of CORDIAL®, which makes it especially suitable for laboratory use, is its thermal resistance, the following individual properties being of particular validity. The maximum permissible operating temperature for CORDIAL ® is 500°C. Above a temperature of 525°C the glass begins to “soften”, i.e. it begins to change from the solid state to the viscous state. CORDIAL ® not only has a high resistance to chemical attack but it also has a very low coefficient of expansion and, as a result, a high resistance to thermal shock. This thermal shock resistance exceeds that of ordinary glass by a factor of three. That means that any change from hot to cold can be handled very well. The linear coefficient of expansion of CORDIAL ® (20/300°C) is 3.3 · 10-6/K. That means that for an increase in temperature of 1000 C0 the glass only expands by 3.3 · 10-6 relative units of length. That is so little that hardly any stress is set up in the glass and the glass does not break when, for example, boiling water is poured into it. CORDIAL ® can be cooled down to the maximum possible negative temperature. That means that CORDIAL ® is also suitable for use in liquid air (approx. -192°C). In general DURAN® products are recommended for use down to -70°C. When cooling down and thawing care must be taken to avoid a temperature difference of more than 100K. When freezing substances in such items as bottles or test tubes, the container should only be filled to a maximum of ¾ of its capacity and it must be frozen on the slant (45°C). CORDIAL ® is suitable for use in microwaves (under suggestion). CORDIAL® exhibits no significant absorption in the visible range of the spectrum(GG17 GLASS). This means that the appearance of CORDIAL ® is clear and colorless. In the approx. 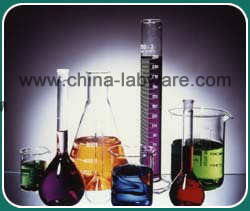 310-2200nm range of the spectrum the absorption of CORDIAL ® is negligibly low. For work with light-sensitive substances the surface of the glass can be tinted brown with a diffusion color. This results in strong absorption in the short-wave region. For work with light-sensitive substances the surface of the glass can be tinted brown with a diffusion color. This results in strong absorption in the short-wave region. The absorption margin for tinted glass is at about 500nm. In photochemical processes the light transmission of CORDIAL ® in the ultraviolet range is of particular importance. The degree of transmission in the UV range shows that photochemical reactions, for example chlorinations and sulfochlorinations, can be carried out. The chlorine molecule absorbs in the 280—400nm range and thus serves as a carrier of the radiation energy. All illustration is supplied by YANCHENG CORDIAL CO., LTD.